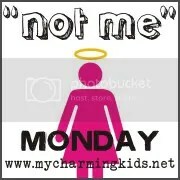 Not Me Monday is inspired by MckMama at http://www.mckmama.net….it is a place for us all to NOT admit all the crazy things that we did certainly didn’t do this week…. I ALWAYS know exactly what my plans are. Therefore, I most certainly DID NOT get the date for my flight to Canada mixed up and think I was leaving on Monday instead of Sunday. Nope, not me. Nor did I buy the ticket without thinking through the fact that on Sunday, I was to finish work at 4:30 pm–when my flight was to take off at 5:50 pm for Toronto. Then, I most certainly did NOT play games with friends on Saturday night, neglecting to finish my packing for my trip. Neither did I forget to do an essential errand before leaving. This most certainly did NOT cause a domino effect of frantic-ness in the two hours before takeoff. More to come on the trip later, I am sure. If you’d like to join in the Not Me! Monday fun, head over to MckMama.net to find out how! *I certainly did NOT ignore a gut instinct that I shouldn’t try go to church and sit in the sanctuary because I was on call after a busy weekend work shift. Nope, not me. I always listen to that little voice inside my head….Incidentally, if I did try to sit in the sanctuary, it might have been rather disastrous. *I most certainly did NOT read a recent news headline as, “Obama has good luck with enemas”. Nope, not me. I definitely read the correct headline very carefully, and interpreted it correctly–“Obama has good luck with enemies“. And even if I did read it wrong in the first place, it certainly would have made me look again immediately, instead of letting several moments pass without thinking twice.